Issues of leisure and dying are not often discussed in depth by those in recreation or thanatology. However, Recreation, Leisure, and Chronic Illness bridges the gap between leisure and thanatology. Professionals know that when illness, disability, stress, or poverty threaten the quantity and quality of a person's life, leisure takes on great meaning. Readers will find in this truly unique book how leisure can be a positive counterforce to the physical and mental diminishments that erode health and work. 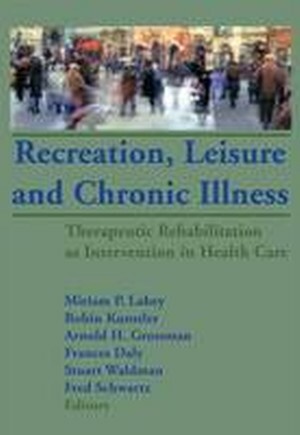 Contributors to Recreation, Leisure and Chronic Illness explore the philosophy of leisure and how freedom, enjoyment, self-determination, and breaking the set patterns of daily life are central to true leisure, for persons in all walks of life. These authors illustrate the need for leisure in a wide variety of settings and in the face of multiple threats to both the quantity and the quality of life. Readers will find chapters filled with expert theories on how to help clients with limiting conditions realize the fulfillment of their leisure desires, the problem of groups left at the margins of the current health care policy who are also poorly served by the leisure professions, and the inevitable funding dilemma. Specific chapters focus on: * improving leisure lifestyles as a crucial first step in rehabilitation * the role and importance of recreation in lives of persons with AIDS * benefits of recreation programs in senior centers and care centers * community-based recreation programs that emphasize preserving existing coping patterns and maintaining daily functioning * the ability of recreation to sustain hope for psychiatric patients * relationships between leisure education and death education * how creative activities--music, dance, art, and creative writing--are used to promote physical mental health While the chapters in Recreation, Leisure and Chronic Illness range from policy issues to specific recreation programs, as a whole they show the healing power of leisure. Professionals and students in both recreation and thanatology fields will find this volume an enlightening approach to promoting healing in those suffering from life-threatening conditions--medical, social, economic, or environmental.